Posted in Misc and tagged Youth Defence at 12:35 pm on May 28, 2018 by Bodger. This afternoon, Erick Locke was found guilty at the Central Criminal Court of murdering Sonia Blount at a room in the Plaza Hotel, Tallaght, Dublin 24 on February 16, 2014. 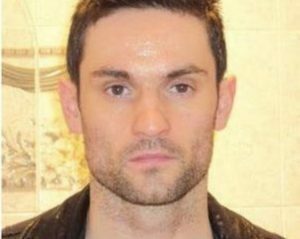 Man uses fake Facebook profile to lure ex. girlfriend to a hotel room. Brings along with him a “pellet gun, Stanley knife and cable ties”. But only to “frighten her” he claims. When she screams, the mother-of-one is “strangled and suffocated”. Locke is suffering from Pervasive Developmental Disorder, he says. Defence barrister Patrick Gageby agrees that the psychiatrist appears poorly prepared but said he was ‘not so sure’ that the diagnosis of PDD was challenged. Well today it was. Locke will receive a mandatory life sentence. Who is the psychiatrist? 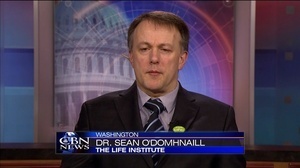 Dr Seán Ó Domhnaill, leading member Youth Defence since its foundation and spokesperson for the group in the 1990s and 2000s. Posted in Misc and tagged Youth Defence at 5:36 pm on May 22, 2017 by Broadsheet. 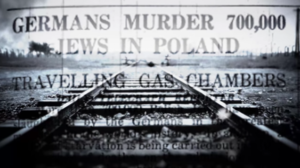 The latest video from Youth Defence. Calling for the 8th amendment to be “saved”. Includes, segregation, the Holocaust and “discrimination against those who are deemed imperfect”. Posted in Misc and tagged Repeal the 8th, Youth Defence at 3:52 pm on September 26, 2016 by Broadsheet. Spotted in Galway. A new low for Youth Defence. Posted in Misc and tagged Abortion, Pro-Life, Youth Defence at 3:41 pm on June 27, 2016 by Broadsheet. 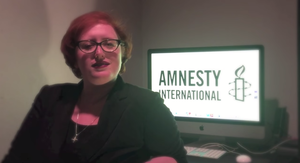 A satirical swipe at Amnesty International by Youth Defence. 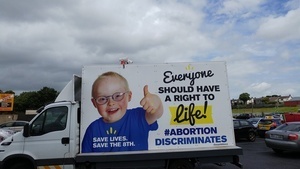 Posted in Misc and tagged Abortion, Youth Defence at 5:03 pm on September 30, 2015 by John Moynes. “Over the years, we’ve learned at an enormous cost that many organisations, including our own – the political class, the church – many organisations that there was too much deference to, over time. And the charity sector’s no more. We cannot assume that because it’s charitable that it’s holier than thou and that it’s good. There are many organisations that I have many concerns about and I want to mention one on the record here which is Family and Life. And I’ve the letters that they’ve sent out to, what I think, are a very targeted audience, primarily elderly, vulnerable people, soliciting donations up to, and including, €7,000, in the name of charity. I think it deserves a more strong light to shone in on that particular organisation. 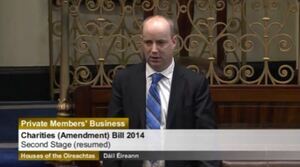 West Cork Fine Gael TD, Jim Daly [top] speaking in the Dáil last night about Family and Life. Earlier this month, Stephen O’Brien of The Sunday Times reported how Family and Life has refused to register with the Standards in Public Office Commission (SIPO) even though it was warned it was breaking the law by paying for a ‘fact finding’ mission to America for Fine Gael TDs Fidelma Healy Eames and Paul Bradford. Posted in Misc and tagged Donations, Family and Life, Jim Daly, Youth Defence at 10:22 am on January 23, 2014 by Broadsheet. I thought you may be interested in this very good response from the Standards In Public Office Commission SIPO regarding Youth Defence funding and SIPOs lack of power of enforcement to comply. It is pretty comprehensive and I get the feeling when reading it that they, SIPO, are frustrated with Youth Defence’s refusal to co-operate. But that is my interpretation. I think the response makes for interesting reading and is a good summary, I believe, of what has been done to date. It appears SIPO still have no powers to force YD to respond to any of their requests. This needs to change. And just to throw it out there, would any of your readers have any suggestions on how Joe Voter might act to get these powers given to SIPO? You will see that the definition of ‘political purposes’ is quite broad and while the Standards Commission is firmly of the view that the activities of Youth Defence are captured by this definition, it has not registered as a third party. The Standards Commission has been in correspondence with Youth Defence and asked it to consider whether it should register as a third party. 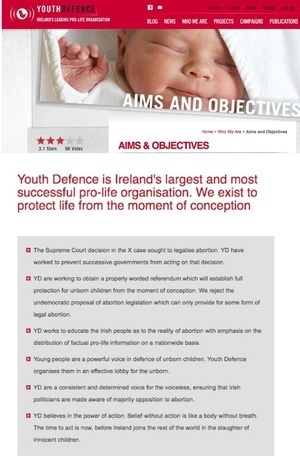 Youth Defence responded and stated that it does not need to register as a third party. We wrote again to Youth Defence and asked it to reconsider its decision. We also wrote to Youth Defence in accordance with section 4(4) of the Electoral Act 1997, as amended, which provides that the Standards Commission may make such inquiries as it considers appropriate and may require any person to furnish any information, document or thing in the possession or procurement of the person which the Commission may require for the purposes of its duties under the Act. We await its response. There is no penalty for failure to comply with this provision of the Act. We wrote to the Minister for the Environment, Community and Local Government on a number of occasions during the past and alerted him to the absence of a sanction for failure to comply with a request for information under section 4(4). We also highlight this issue, along with other recommendations for changes to the legislation, in our annual reports. 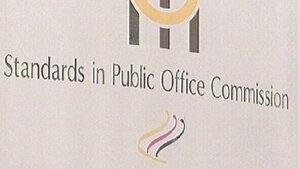 To date the legislation has not been amended to take into account the concerns of the Standards Commission. However, a recent response from the Minister confirms that consideration will be given to our recommendations for changes to the legislation in the Electoral (Amendment) (Referendum Spending and Miscellaneous Provisions) Bill, which is on the Government’s legislation programme. Also, there is no sanction for failure to register as a third party. …third parties are not required to disclose from whom it receives donations. In this regard your complaint is ” … non declaration of donations.” by Youth Defence. Registered political parties are obliged to furnish the Standards Commission with a Donation Statement annually, but registered third parties are not. As stated above, Youth Defence is not registered as a third party. The activities of a group that is not registered as a third party are outside the legislative supervision of the Standards Commission. Section 25 of the Electoral Act 1997, as amended, sets out the offences and penalties for various categories of individuals and groups, in relation to donations etc., and unregistered third parties is not one of those categories listed in section 25. In essence, without legislative support, the Standards Commission is not in a position to act on your complaint. Posted in Misc and tagged Youth Defence at 3:33 pm on August 14, 2013 by Broadsheet. 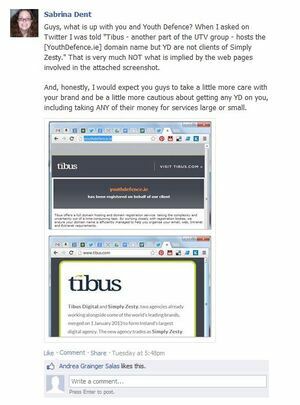 Web design wizard Sabrina Dent inquires as to Tibus/Simply Zesty’s client list with little success. Posted in Misc and tagged Youth Defence at 2:13 pm on July 11, 2013 by Admin. Folks, please don’t link to the list of email addresses – we’ll just remove the comment. 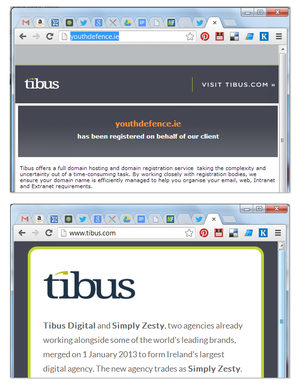 Posted in Misc and tagged Hacking, Youth Defence at 8:52 am on July 9, 2013 by Broadsheet. 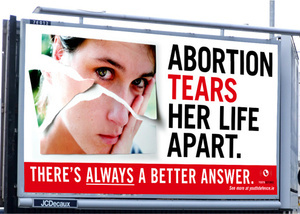 Posted in Misc and tagged Abortion, Youth Defence at 5:13 pm on July 5, 2013 by Broadsheet.